As I approached the end of 2017, the two things that stood out when looking back over the year were 1) Lincoln’s birth and the vortex of life with a newborn, and 2) illness (lots of it)! It seemed like a year of survival rather than flourishing or achieving, and honestly, by the end, I felt a little defeated and knocked around. A one week TV ban back in late June was far and away one of the most positive parenting moves we’ve made, and seven months on the ban is still in effect. This change was motivated not by concerns for her development, but entirely by a self-interested desire to avoid the whinging and tantrums that went along with her wanting to watch ‘just one more?’! It worked! One of the advantages of J working from home is that we’ve always been able to do an early dinner as a family. Last year we started a practice of taking turns at dinner time to share something from the day that we’re grateful for. Dinner time is a challenging time of day – everyone is tired, hungry, feeling rushed and ready to get through the bath/bedtime routine – so this practice temporarily pulls us out of that mindset and forces us all to reflect on our day and find the good. It also feels important for me to set up small practices now that may help my kids’ mental health as they get older. Thanks to Kristen for recommending this! We didn’t do heaps of it in 2017, but Ella is now at an age where she is more capable of independently walking a few kilometres, so we did manage a few longer walks at Tidbinbilla. Walking in the bush makes me happy and relaxed, and with nothing else to do but walk and talk (no housework, meal prep etc) I find I’m a more present and engaged mum. I think this is another little practice that will be increasingly important for our relationship and mental health as she gets older, and I love developing a shared passion with her. In many ways (financial, environmental) I would like to have fewer cars, so I was a bit reluctant to include this in a list of what went well. We could have made do this year, but with the additional stresses and logistical complexity of a new family member, Jason and I could do without the potential source of stress and conflict in negotiating car use. In 2017 we did a few small things to improve our home. None were done cheaply (but they weren’t expensive major renovations either) – new dining chairs, a new back fence, replacing the back sliding door, a block out awning for our west-facing deck – but they added a lot of value to our lives. Spending money to make our home more enjoyable and comfortable feels like a worthwhile investment. L was born through the Canberra Hospital’s Birth Centre program (as was E). I had another hugely positive experience and received excellent care from a wonderful midwife. I am so grateful for the access to this program and can’t recommend midwife-led care highly enough. Last year we transformed our spare room (junk room) into a guest bedroom where we accommodated family members for over four weeks, and then into a nursery for L. As our family has expanded, our home hasn’t, so it’s really prompted us to get rid of a lot. I’m far from my ideal decluttered home, but it’s a journey and we’re making progress. We’re also being much more intentional about toys and gifts for the kids and our families are getting on board too. For Christmas 2017 the kids got fewer toy gifts, and more practical or experience ones (a trip to the zoo, new sandals, a cupcake and movie date, a new lunchbox etc). I’ve been using Day One for a couple of years and it has certainly made it easier to maintain a regular journaling practice. Last year I upgraded to the subscription-based version – it’s one of the best things I’ve spent money on. I have several journals set up – including one for each of the kids. Having it always available makes it easy to just snap a photo, jot down a funny thing they say, or capture a few words to remind me of what we did on that day. The ‘on this day’ feature and the practice of re-reading and reviewed past entries is also something that I get more benefit from than I expected. I’ve wanted to be in a book club for ages but never found one that read the kind of books I did – non-fiction, mainly psychology, management, and leadership. Joining the LML book club has been such a delight. I’ve read some books that I wouldn’t have otherwise, the act of discussing a book reinforces the learnings and deepens my reflection, and I have a regular time set aside to spend in authentic conversation with some wonderful women. Without family support in Canberra, I was much more realistic this time around that we’d need to pay for support. Having time away from the daily ins and outs of child care has helped me mentally and to maintain my sense of self. I believe it’s also valuable for my kids to interact with and be cared for by other trusted adults. I learned and forgot and re-learned this lesson several times over 2017! I pride myself on being an easy-going, low fuss kind of person and I hate feeling like I’m inconveniencing people or taking up too much of their time or resources. But in 2017, in some big and small ways, I had situations where I had to back myself and be really clear about what I, or my family, needed and wanted – telling my GP that I still wasn’t well and wanted further investigations, making a complaint at the hospital my mum was in and advocating for improvements to her care, getting Ella the help she needed from a more experienced swimming instructor. And every time I raised an issue or asked for additional support, things got better. 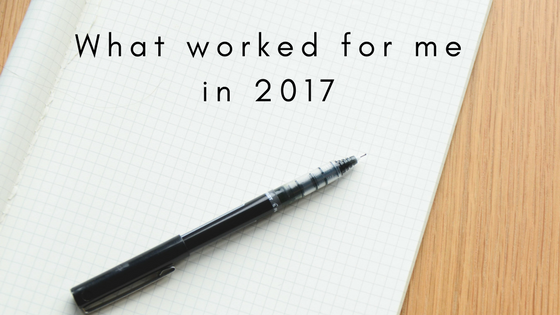 Although it may now feel like a distant memory, I’d love to know what worked well for you in 2017? !